Need help selecting the right spring for your vehicle? 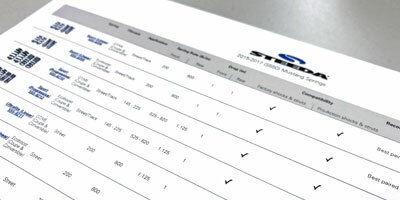 Looking for data on rates, drop, compatibility and recommendations from our Performance Experts on Shocks & Struts, Sway Bars, Camber Plates and more? Check out the Steeda S550 Spring Guide, it's based on real world data and feedback from thousands of Steeda equipped street, race and drag Mustangs. We offer the best, not the cheapest aftermarket lowering spring upgrades for your Ford Mustang right here on Steeda.com! Our coil springs are linear, dual-rate, and progressive wound to specific spring rates for optimum handling performance at the race track, the most comfortable ride on the street, and a perfect looking aggressive stance at a show. Vehicles in this Category: S550 2015, 2016, 2017, 2018, 2019 Ford Mustang GT, Ecoboost, V6, GT350, California Special, Magneride & Performance Pack.